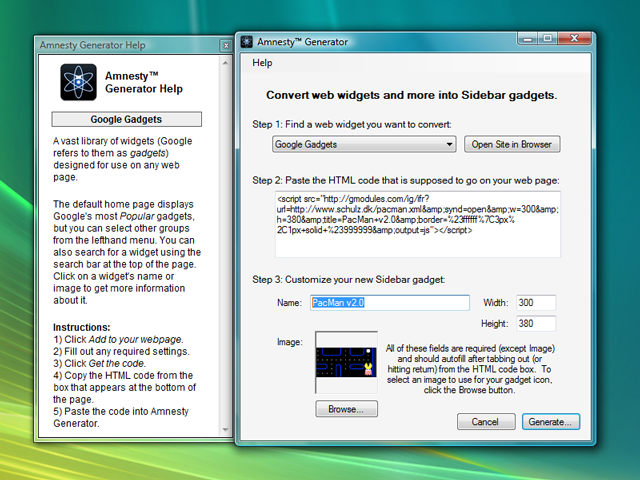 With Amnesty Generator, you can easily convert millions of web widgets, games and videos – designed to live on home pages, blogs or MySpace – into gadgets for your Sidebar. If you like widgets on the web, you’ll love them on your Sidebar. In this guide you will learn how to do get this software working on your PC. Now you can place Google gadgets, Grazr RSS readers, YouTube videos and more onto your Sidebar. Copy and paste the HTML code for a web widget directly into Amnesty Generator and generate a new Sidebar gadget with the click of a button. Where Can I Get Amnesty? I have been looking for something like this forever… I am so glad I subsribed to your feed!! This can be fun! But I got tired of it rather quickly..